Tubular netting is a variation of tubular peyote stitch. You may find it easier to learn if you are already familiar with the basics of even count tubular peyote since it uses a similar stitch pattern and step-up after each row. You may also find it easier if you are familiar with flat horizontal netting stitch. Tubular netting will result in a lacier open stitch than tubular peyote. The look can vary depending on the size and type beads you use, as well as the number of beads in the round. This tutorial will show you a basic tubular netting stitch that you can use to make a tube bead like the one shown, a bracelet, necklace, or purse strap. Most any beads and thread can be used with tubular netting. This tutorial uses WildFire beading thread, a Tulip bead needle, and size 11 Czech beads. Round beads tend to work better than cylinder beads, but you can try it with any of the many types of seed beads. 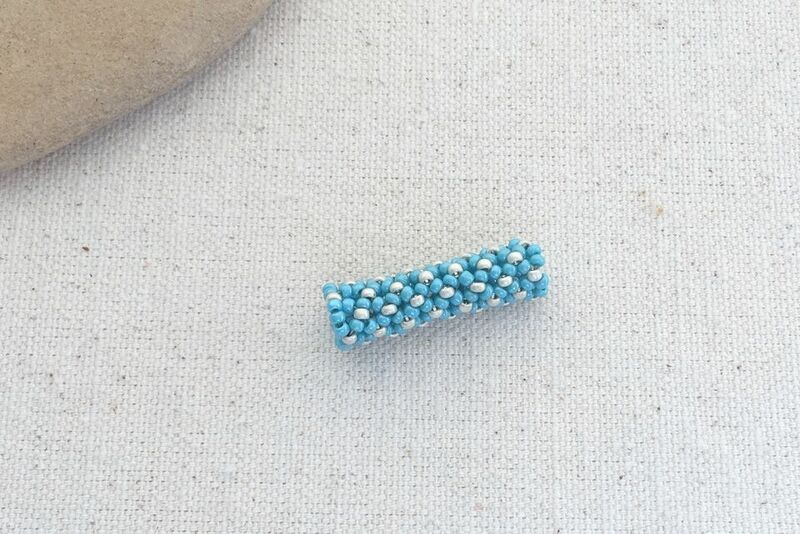 To get started, pick up four groups of three seed beads and slide them down to the end of your beading thread, leaving enough tail thread for, however, you plan to finish your project. Since this will be a tube bead, there only needs to be enough tail thread to weave back into the project. If you are going to add a clasp, you will want to leave more thread. Put your needle through all of the beads and draw them into a circle. Tie an overhand knot with the two ends of the thread to secure. I find that the beads will naturally draw into a circle as you are tying and pulling the knot closed, so if you are having difficulty getting them into a tight circle, that is the trick. After tying the overhand knot, stitch through the first bead in the circle. In this case, that is the yellow gold lined bead. This puts you into position to make your first stitch. To make the first stitch, pick up three seed beads. Skip two beads on the base row and stitch into the third yellow bead. Like most tubular stitches, tubular netting can be easier to hold and stitch if you put it on a rod, dowel, pen, or another cylinder shape to help hold it in place. This project is an alternating pattern with blue body beads and yellow connector beads. The connector beads are the ones you stitch through to connect the rows. Note also that the first row (the circle of beads) has one bead less per stitch than the rest of the netting stitches. To make a bead, it helps to start the first ring a little tighter. You can see an example of a tube bead that didn't start like this at the end of this article and the tube on one end seems a little stretched out. This is a good solution to prevent that. Continue to add three beads and stitch into the third bead on the base row. After you have done this four times, you will need to step up to the next row. To step up, stitch through the first two beads of the row you just started. This will move you into position to start the next row. For each of the following rows, pick up three seed beads, stitch into the fourth seed bead (in this case, it is the yellow bead). Pull the thread tight after each stitch. The tension is important in a stitch like tubular netting to avoid the thread showing and to keep the round shape consistent. At the end of every row, step up by stitching through the first two beads you added on the row. This picture is after about three or four rows. It takes a little while before you will see the shape and pattern develop. After a couple of more rows, the shape holds better, and you can see the pattern start to show. Depending on how you like to work, you may prefer to remove it from the tube or continue working on the tube until you are finished. If you choose to do your beadwork on a tube, make sure the beadwork is a bit larger than the tube. It should not fit snug, or you risk removing your beadwork only to find out that the thread is showing and the tension is loose. Just like the beginning row of the tube bead, this is finished by tapering it closed slightly. To taper the end, use two beads for each stitch on the last row instead of three. Following the example, pick up two blue beads and then stitch through the yellow beads on the prior row. Pull tight, and you will notice the lip of the tube will pull in slightly. 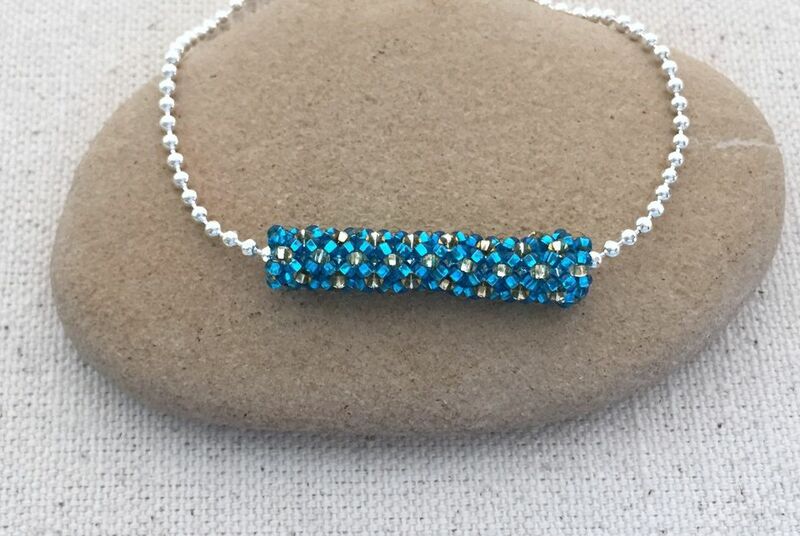 This makes a nice end to a tube bead or a rope chain on a necklace or bracelet. If desired, you can continue adding rows and decreasing the number of beads to make the end even more tapered. This tubular netted bead uses the same pattern in the tutorial, but it didn't start with a row with one less bead. You may be able to tell that the left side of the tube looks a little stretched out compared to the right where the end of the tube was tapered down to the two beads in each stitch.